The proposals for ICZM-MSP for the Emilia Romagna Region were formulated within the Italian National Project RITMARE. They are focused on marine and maritime research topics, according to the priorities of the EUSAIR Action Plan and in line with the implementation of the MSP Directive. The study area is the marine area in front of the coast of Emilia Romagna Region, in the north-western Adriatic Sea. The study activity was developed in two phases: (i) creation of a knowledge reference framework and its analysis to support maritime spatial planning and (ii) Identification and analysis of possible management objectives and measures to implement them. A set of 9 measures was proposed concerning 6 major uses of the marine space. An integrated “managed development” scenario which considers all the measures implemented at the same time was finally considered. This final scenario was re-analysed using tools for use conflict analysis and for cumulative impact analysis, already developed within previous projects and also previously used to characterise the study area (phase 1). This led to an assessment of possible overall reduction in use conflicts and in cumulative impacts deriving from the application of the proposed measures. The study concluded with the identification of next investigation needs, considering that suggested proposals should be considered as preliminary or as a valuable basis for further studies and discussions. (iii) Implement a strategy of prevention and mitigation of natural impacts (the sea as a risk factor). The pilot plan is not legally binding. The measures suggested by the study are a concrete exercise of MSP for the study area and should be considered as preliminary or as a valuable basis for further studies and discussions. The proposals for MSP include valuable, though preliminary suggestions which could flow in the Maritime Spatial Plan of the Adriatic maritime area facing Emilia-Romagna coast, to be developed accordingly the MSP Directive (2014/89/UE) and the related national legislation (D.Lgs 201/2016). Sectorial plans (e.g. aquaculture, coastal defence, erosion) at regional level could also benefit from results of the study. 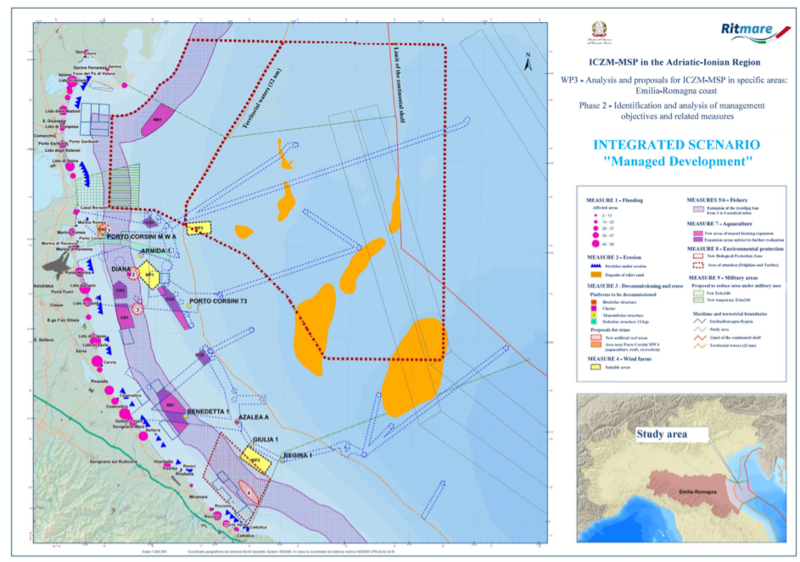 The proposals for ICZM-MSP refer to the marine area of the Northern Adriatic Sea located in front of Emilia Romagna Region (Italy). The proposals for ICZM-MSP for the Emilia Romagna Region were formulated within the Italian National Project RITMARE. The project ran between 2012 and 2017. The proposals were finalized in December 2017. Consolidating and updating the knowledge reference framework and the operational management tools to support decision processes. Reduce environmental impacts, in particular in the area closer to the coast (0 to 6 nm), and increase the level of protection of relevant habitats and species. 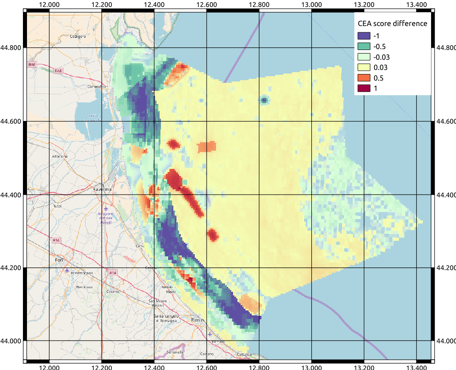 The study was developed in two phases: (i) creation of a knowledge reference framework and its analysis to support maritime spatial planning and (ii) Identification and analysis of possible management objectives and measures to implement them. Within the first phase, the study area was defined and the knowledge reference framework was updated. The analysis of use conflicts and cumulative impacts was performed, capitalizing on the results of previous projects (SHAPE and ADRIPLAN) and recent and expected time trends were analysed. In the second phase of the study, these trends were used to define a “vision proposal” for the study area and to identify the main planning and management objectives for different sectors (tourism, energy, fisheries, aquaculture, coastal defence and military use). This vision is focused on coastal and maritime tourism (with connected supply chains) as the pivotal use of the maritime economy of the Emilia Romagna coastal system. The vision and its related actions should ensure that the coastal and marine space is not overload by excessive tourist activities and infrastructures and should let the other human uses grow without impacting the resources on which tourism depends. A portfolio of nine sectorial measures, finally integrated in the so-called “managed development” scenario, was proposed accordingly to the vision and the objectives previously defined. Even if the proposed measures could be implemented independently and reflect specific sectorial needs, they were developed considering mutual connection and explicit elements of synergy, consistently with a general planning and non-sectorial vision. Reduction of surfaces subjected to military constraint reducing conflicts with other existing or proposed uses (measure 9). The integrated “managed development scenario” which considers the implementation at the same time of all 9 measures, was finally re-analysed using the tools and conceptual models already used in the knowledge framework to characterise the study area. These tools (Conflict score tool, based on FP7 project COEXIST methodology and Cumulative Impacts tool) were initially developed within the ADRIPLAN Project and then updated and improved within the RITMARE Project. The study was carried out in strong collaboration with the Emilia Romagna Region (Land and Environmental Department), as part of an Institutional Collaboration Agreement for study and research activities aimed to plan and manage of the coastal zone of the Emilia-Romagna Region and its marine waters (Regional decision DG 2274/2016). Several other departments of Emilia Romagna Region and the Regional Environmental Protection Agency (ARPAE) were actively involved in this study, participating in two workshops and several discussion meetings. The Environmental, Informatics and Statistics Department (DAIS) of the Venice Ca’ Foscari University also contributed to the development of this activity, concerning in particular the development of proposals in the aquaculture sector. The overall stakeholder engagement supported both the phase of analysis of the knowledge framework and the phase of proposal development. National (Italian) Research Programmes funded by the Italian Ministry of University and Research. overall project budget amount to 250 million euros, co-funded by public and private resources. Direct costs of the practice elaboration are unknown.